With large openings, minimalized bezels, distinctive contoured typography, lancet-shaped hands and skeletonized horns, the signature TimeWalker aesthetics celebrate horology in a highly contemporary way. The design and the functionality of the model is further highlighted by the use of high-tech materials such as titanium, carbon fibre and diamond-like carbon (DLC), which make the timepieces extremely lightweight and robust. Performance and design are also continued through to the calibres with a selection of automatic movements and useful complication. For the TimeWalker ExoTourbillon Minute Chronograph Limited Edition 100, Montblanc has chosen its ExoTourbillon complication for the very first time in the collection. The patented ExoTourbillon has graced a number of timepieces in the Maison’s classic Heritage Chronométrie collection, but never before has it been seen in the TimeWalker line. The one-minute ExoTourbillon complication was developed entirely in-house by the master watchmakers at the Montblanc Manufacture. The Exo in the name is derived from the Greek for external or outside and refers to the screw balance, which is positioned outside of the tourbillon’s rotating cage. This original patented architecture allows the cage to be smaller in size and free of the weight of the balance, saving 30 per cent more energy than a conventional tourbillon. The fact that the balance is positioned outside of the rotating cage also means that it isn’t affected by the inertia of the cage, therefore improving precision. A particularly useful feature of this movement is its stop-second mechanism, which directly halts the screw balance by means of a tiny spring, and allows the user to also set the seconds precisely. The stop-second mechanism instantly stops the balance from rotating, instead of halting the tourbillon cage, which can cause the balance to continue swinging and upset the precision. A practical hour setting allows the user to advance the hours in hourly increments in the second position of the crown forwards and backwards thus ensuring quick and uncomplicated time setting. Repositioning the hour-hand has no effect whatsoever on the minute- and second-hand, so the precise time is always preserved. This function is linked to the date, making setting the timepiece while travelling a breeze. To set the date display, the user advances or retreats the hour-hand through 24 hours. Whenever this hand’s tip passes the 24th hour, the hand of the date display either advances or retreats accordingly. 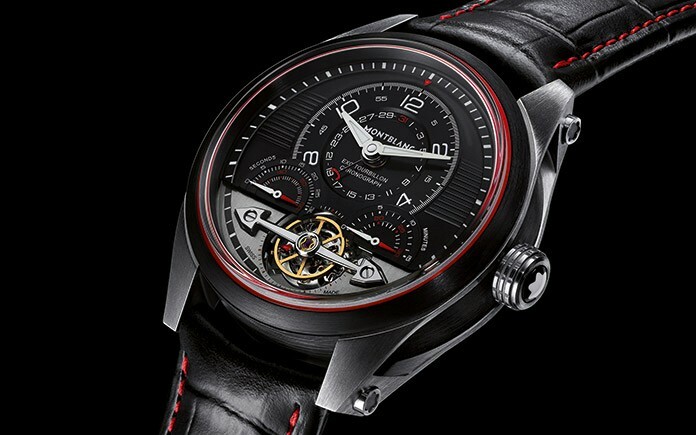 In the third position of the crown, the time can be adjusted and a red arrow hand is displayed on the tourbillon cage for an exact setting of the seconds. This innovative Tourbillon construction is integrated in Montblanc’s own in-house developed chronograph calibre that combines all the elements of a traditional chronograph with a contemporary highly performant construction: monopusher with column wheel, efficient and precise vertical coupling, automatic winding and two Barrels. For the TimeWalker ExoTourbillon Minute Chronograph Limited Edition 100, the movement’s skeletonized winding rotor, with its pierced Montblanc emblem, has been darkened with a coating of black rhodium and is on full display through the timepiece’s titanium caseback. 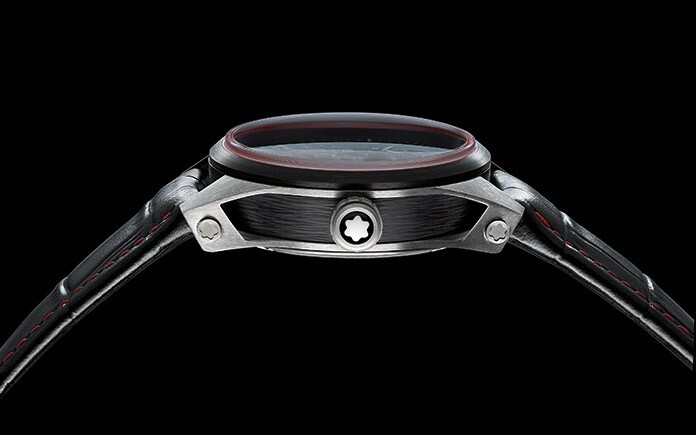 Performance continues through the timepiece’s 44mm three-part case with a unique material mix of titanium, carbon fibre and DLC (Diamond Like Carbon). The micro-blasted titanium bezel is coated with a scratch-resistant black DLC, while the middle piece of the case is crafted from a unique structure of carbon fibre, which has an unusual horizontal striped pattern rather than the more common mesh motif. Several dozen layers of carbon fibre, with the fibres in each layer oriented at 90° to those in the preceding stratum, are fused together with artificial resin at high temperature with a pressure of 10 tons. This produces a compact carbon-fibre block. The case’s round sheath is stamped perpendicularly to the carbon-fibre layers to form a seamless “monoblock” which is then tautly stretched over the case’s titanium middle piece before being clamped into place with two pierced longitudinal titanium brackets with a sophisticated brushed surface decoration. The result is a lightweight yet robust case that protects the movement beneath and accentuates the distinctive TimeWalker look. 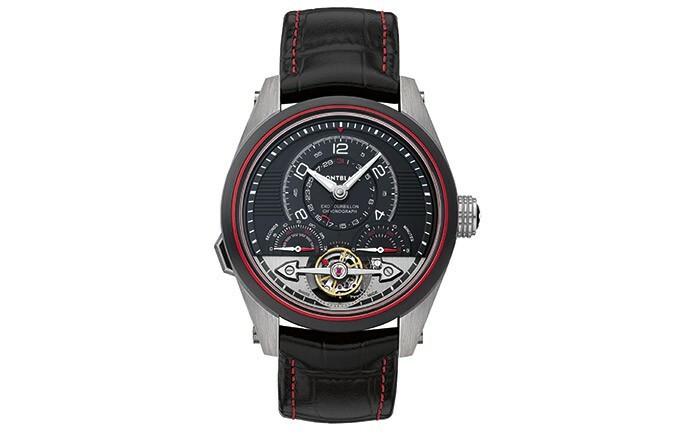 The grainé dial of the TimeWalker ExoTourbillon Minute Chronograph Limited Edition 100 accentuates the Maison’s focus on aesthetics, performance and legibility, with the time displayed in an-off-centred black dial at 12 o’clock with a mix of red and white Arabic numerals that have been enhanced with a luminescent SuperLumiNova®* for easy reading at night. The lower section of the dial showcases the patented Exotourbillon and features two semi-circular counters with their double indication hands at 8 o’clock for the elapsed-seconds, and 4 o’clock for the elapsed-minutes. The backdrop of the top part of the dial is embellished with black horizontal stripes, while the lower part is decorated with vertical satin finishing to enhance the patented ExoTourbillon mechanism. The dial is enhanced by a domed sapphire crystal with anti-reflective treatments on both sides and vertical flanks, providing excellent visibility, scratch-resistance and ultimate performance. The black alligator strap with red stitching reinforces the urban look of the watch. All 100 pieces in this limited edition have been rigorously tested by the Montblanc Laboratory Test 500 that simulates real-life situations for 500 hours. The TimeWalker ExoTourbillon Minute Chronograph Limited Edition 100 collection represents the peak of the Maison TimeWalker line. From its modern design to its high-performance movement and mix of high-tech materials, this is a timepiece that brings the finest traditional watchmaking codes to the future of timekeeping.